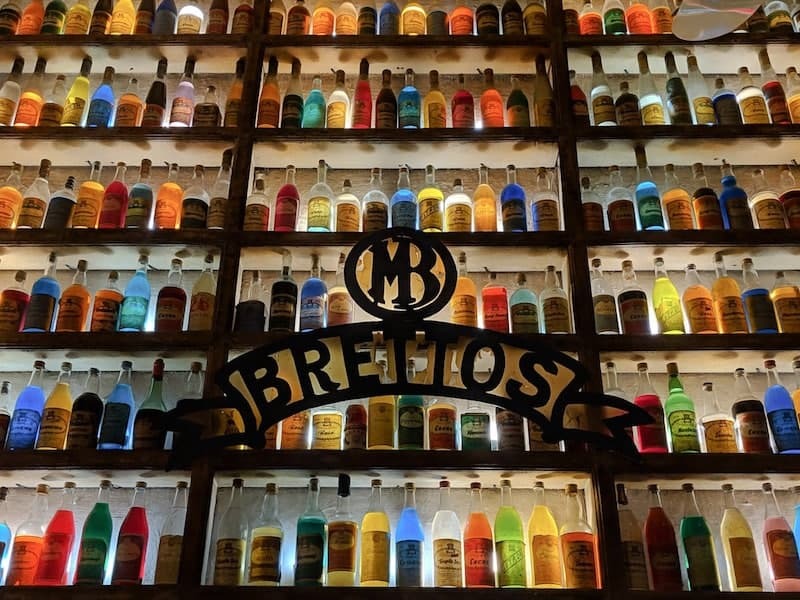 Save yourself from mediocre moussaka with this extensive guide to the best food and drink in Athens. It’s an exciting time to visit the Greek capital, with an explosion of cafes, bars and eateries opening up, alongside a fresh appreciation for the food heritage and amazing natural produce available. But I know how difficult it can be to avoid the tourist traps when you’re new to the city. 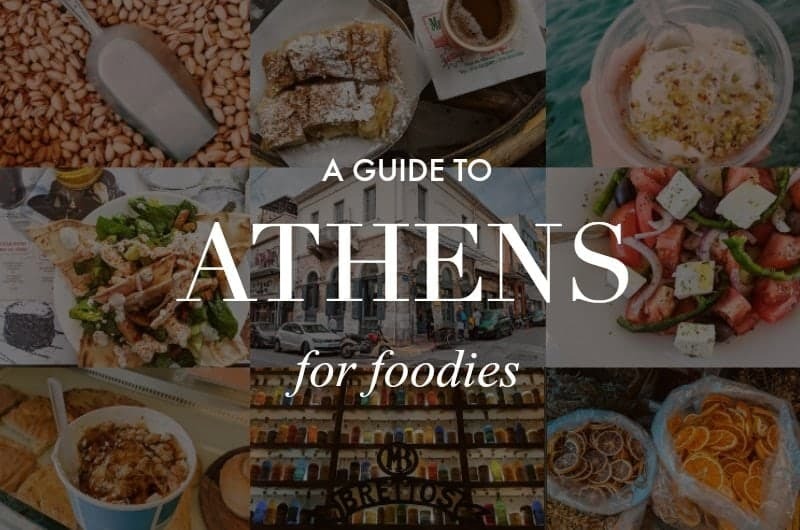 I’ve spent an extensive amount of time in Athens (the city adopted me in 2016 and I couldn’t tear myself away) exploring its food scene, hunting down the best places to eat and drink. Friends don’t let friends eat at sub-par tavernas whilst in Greece, so here is everything I know about eating and drinking well in Athens. I’ve included links to Google Maps locations throughout this post so you can easily save them to your own account ready for your trip. Breakfast is not really a thing in Greece. The old joke that a Greek breakfast is a frappe and a cigarette is not too far off the mark. If anything is eaten, it’s a koulouri (a knotted bread snack, usually with sesame) from a street vendor or a flaky phyllo pastry from one of the city’s multitudes of bakeries. Bougatsa – a delicious and addictive custard pastry – is available for the sweet-toothed and usually taken sitting down with coffee, whilst savoury-lovers can plump for a spinach or feta pastry which you can get. In the centre, you might also find a few places selling Greek yoghurt though this is mainly an invention for tourists. An increasing number of trendy bars and cafes do brunch on Sundays (try Harvest or Mama Roux). There’s a strong tradition of eating out in Greece. Athens has a lively cafe and taverna scene (except in August when most of the city is away on summer break). Dinner is taken late (similar to Spain), local restaurants start to fill up around 10pm with multigenerational groups. Long, leisurely lunches are also a thing. Taverna menus usually consist of hot and cold mezedes (including dips), salads, meaty mains (grilled meats as well as dishes like moussaka), fish and seafood. When ordering at a taverna do bear in mind that menus are designed to be ordered for the table, rather than individual starter-main-desert. This means that portions of hummus and tzatziki are humungous, and mains might come on their own (without sides). 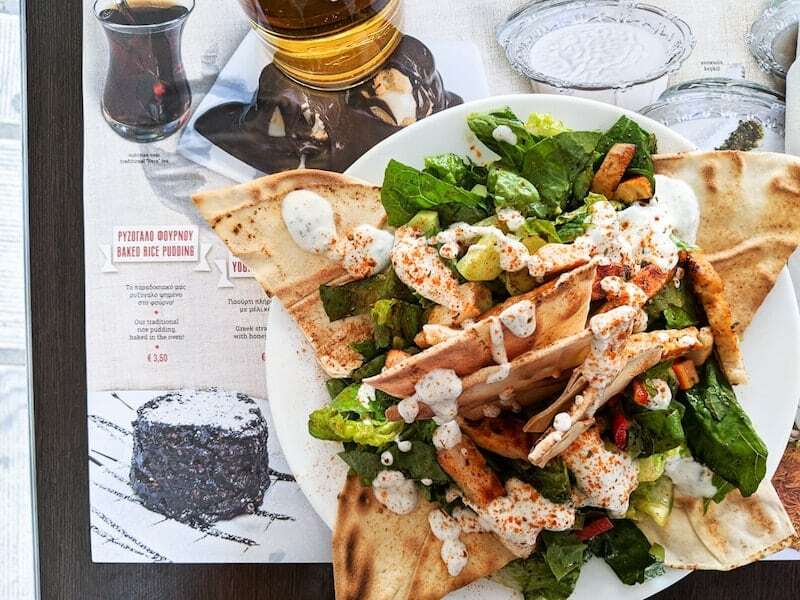 The exception is souvlaki portions which usually come with salad and fries (keep reading). 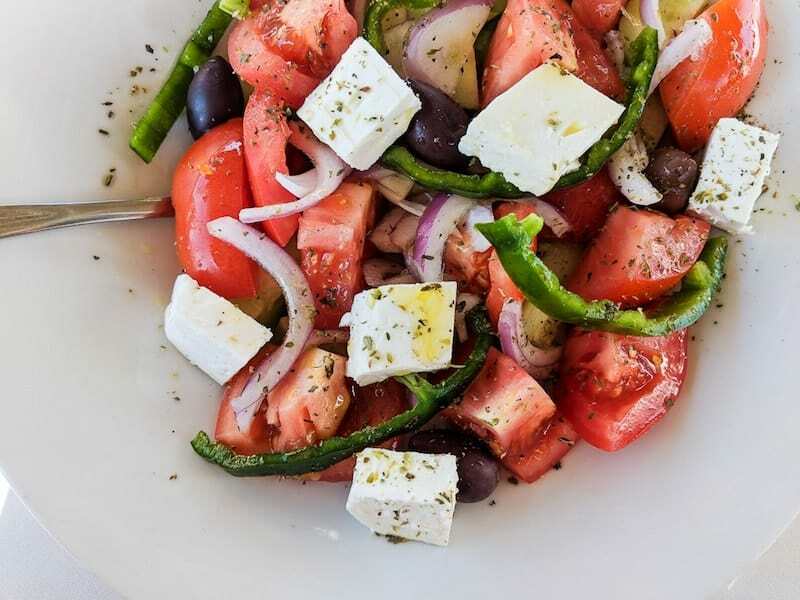 All tavernas have a couple of salads on the menu, including the ubiquitous Greek salad which consists of tomato, cucumber, red onion, and feta (or horiatiki to give it its proper name). As these are for the table they tend to be on the large side – it’s not uncommon to find a whole portion of feta plonked on the top. So they make a great lunch when visiting Athens – a salad, some crusty bread and a fresh squeezed orange juice in the sunshine – perfect. If you’re in a group, it’s possible to feast like royalty for €15 a head. Don’t forget to ask your waiter what’s fresh. 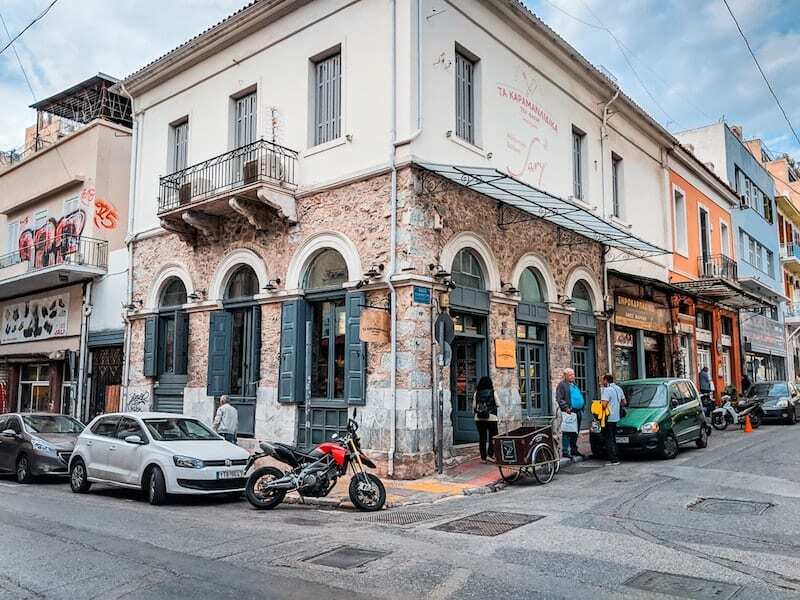 Generally speaking, the tourist areas of central Athens – that’s Plaka in particular, but also pretty pedestrianised Adrianou Street with its twinkly lights and Acropolis views – are full of overpriced tavernas with mediocre food. Avoid anywhere with someone outside trying to thrust a menu into your hand. Even more so if the menu contains photos and/or international food. For one-person portions (or a break from taverna food), try a wine bar for bistro-style menus. Smoking is still everywhere in Greece. Yes, it is illegal, as per EU rules, but it’s unilaterally ignored and bribes/fees paid to the police rather than lose. If you see a plastic cup in place of an ashtray, it’s so the place in question can claim it’s no-smoking – see, no ashtrays! Non-smokers will find this particularly hard over winter when many cafes and tavernas put up transparent tarpaulin or close windows to become ‘indoors’ rather than ‘outdooors’, and trap all of the smoke. If you’re looking for smoke-free zones check out this article from Greece Is magazine and this one from Travel Greece Travel Europe. Let’s take a moment to talk about souvlaki. It can get a little confusing. The term souvlaki refers to meat cooked on a skewer (you might also see it referred to as straw). Regional variations confuse things further. But here’s a dummies guide. You can also order either souvlaki or gyros wrapped in a pitta. Technically, the term for this is tylihto (wrapped) but if you say pitta they’ll know what you mean. It’s the budget option at just a couple of euros, whereas you’ll pay upwards of €8 for a plate or platter. The pitta is stuffed with fries and salad and sauce and will never taste the same anywhere else so don’t even try. Sometimes you’ll also see kebab on the menu and this refers to ground meat on a stick similar to shish kofte. Still confused? Check out this extensive guide by The Travel Porter. 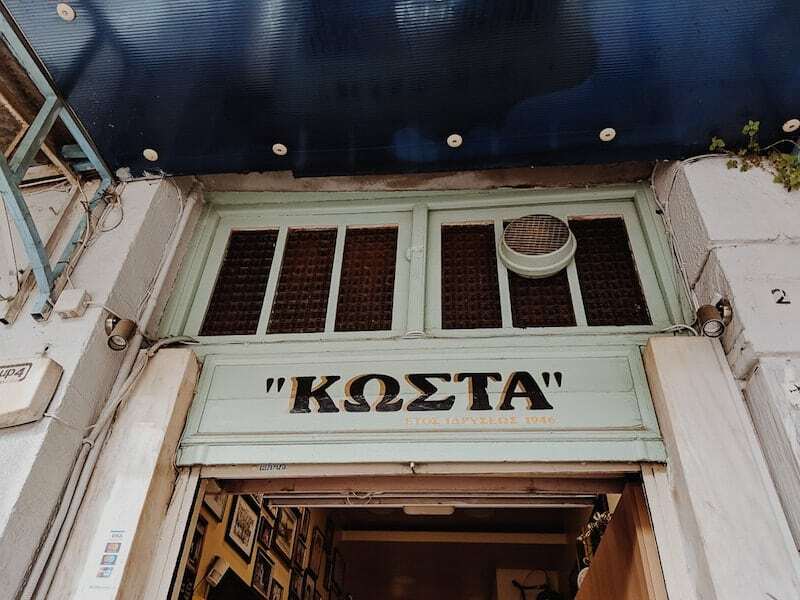 It’s commonly acknowledged that the best souvlaki in Athens is found at two different (unrelated) places called Kostas. You won’t find them open at night though, be there before lunch for the best chance. I haven’t tried either because – much as I love souvlaki, it’s not what I fancy at that time of day. Peak souvlaki can be found in the heart of Monastiraki Square. Pull up a seat at Thanasis or Bairaktaris in this prime people-watching spot. Every neighbourhood has its favourite souvlaki joint so just ask around. Posh incarnations can be found at hipster Hoocut. The key to understanding food in the city is regionalis. Athens experienced huge population growth after the second world war, with people migrating from all over Greece in search of work. As such, it doesn’t have a food heritage of its own per se but a strong representation of regional dishes from all around the country. Nowhere showcases this better than the restaurant in the Acropolis Museum. You’d be hard pushed to leave Greece without trying souvlaki, but I’d also recommend that meat-eaters make a beeline for grilled lamb chops. Ask a local for their recommendations, every carnivore has one. I’m also partial to the grilled sausages. Another dish you must try is prawn saganaki (and I mean the one with prawns cooked in a tomato sauce with feta and ouzo, not the deep-fried prawn). With a cold beer and fresh crusty bread, it’s one of the best meals for one in Greece. Be sure to clarify what you’re ordering though, saganaki simply means fried. Feta saganaki is another favourite, particularly the kind that’s wrapped in phyllo pastry and/or sesame seeds, deep-fried, and served drench with honey. Dakos is a great lunch dish too; a twice-baked barley rusk topped with tomato and cheese. Proper dakos should be served with Cretan myzithra cheese rather than feta. Capers are always a good addition. And fresh grilled octopus is heaven on a plate. If you’re lucky your meal might be finished off with a syrupy spoon sweet – whole preserved sweets served in dainty portions with some yoghurt. There’s no shortage of cafes in Athens. Generally speaking, these are venues for enjoying a lingering freddo cappuccino (iced coffee) over many hours. Greece has more of a coffee culture than a drinking culture. English is widely spoken though, so don’t fret if you forget. You’re welcome to linger over your coffee in Greece. It’s fine (common, even) to nurse it for hours. And nearly every cafe has free wi-fi. This makes Athens a digital nomad’s delight! In prime sit-down locations, you’ll pay a lot more for a coffee – around €4 is not uncommon. A takeaway from the backstreets or a chain such as Coffee Island is about half that. A Greek coffee to go is the cheapest of them all (prices are regulated by the government). 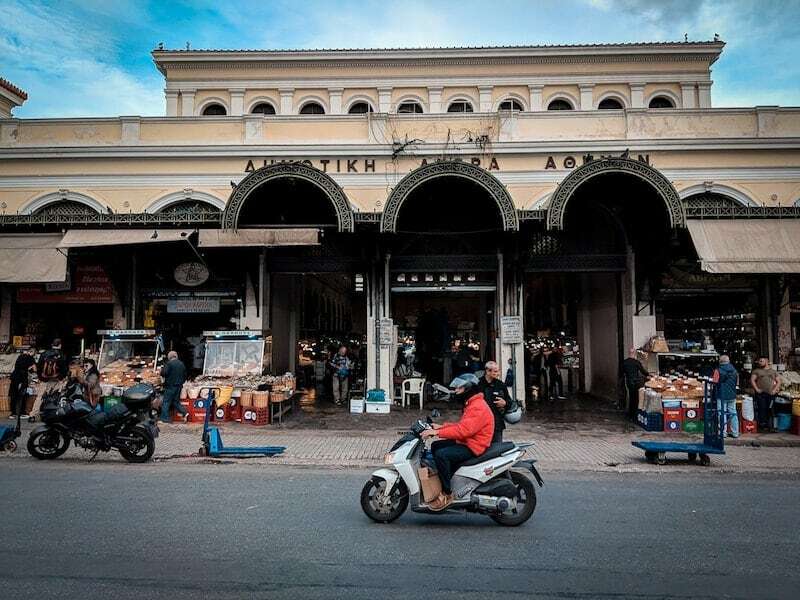 For a Greek coffee made the traditional way – over hot sand – seek out Mokka near the market or Cherchez La Femme. Sometimes it seems every other building in Athens houses a bakery (and the one next to it a cafe). You’ll be able to pick up spanokopita (phyllo pastry with spinach filling) or tyropita (with a cheese filling). You will undoubtedly walk past Meliartos on Ermou Street at some point; this is a top-notch central bakery selling both sweet and savoury goodies and sit. Most bakeries also sell coffee to go, and most takeaway coffee shops also sell baked items – the line is blurred. 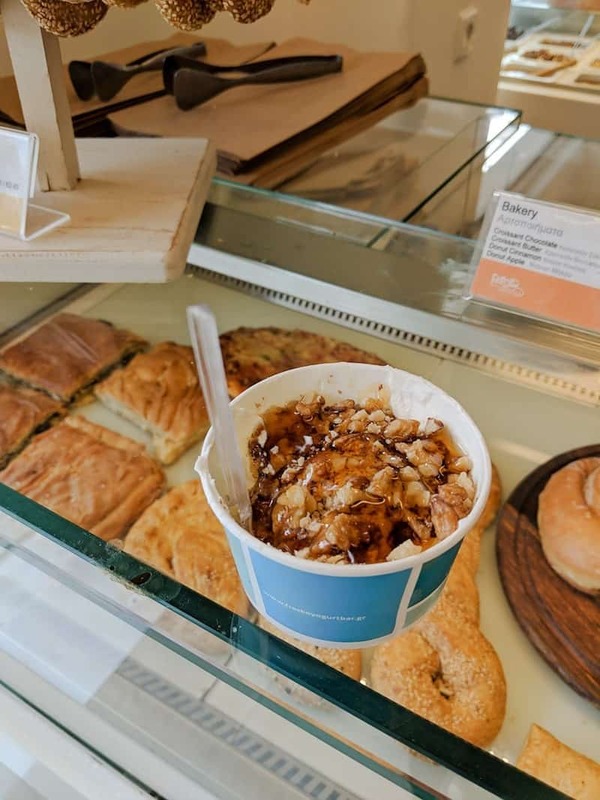 There’s not really a traditional street food scene in Athens although you will find koulouri throughout the city, plus kiosks selling confectionary (and the holy trinity of beer, cigarettes and ice-cream) on every street corner. You can try a traditional hot sahlep drink from the man in Monastiraki Square. In summer you’ll find nibbles like fresh coconut. Pitta gyros and pitta souvlaki are the other mainstays of a budget diet in Greece. For a change from pastry and gyros though, head to Aiolou Street. This centrally-located street is pedestrianised and home to cheap (but good) Greek food of the fast variety, as are the surrounding streets north of Ermou. There’s the city’s best falafel at Falafellas, and nearby the informal Lebanese Feyrouz where you can pick up lahmacun. There’s cones of fried fish and seafood at Zisis and pizza/pide/flatbreads at Smak. And Athens’ first street food court at Str.Eaters. Or you can always poke around in the alleys immediately surrounding the Central Food Market for traditional working fare. Indian restaurant Mirch in Monastiraki does Indian souvlaki wraps to take away. To feed a crowd on a budget check out one of the four outposts of Ladokolla – the one in Dafni is the most central. Instead of plates, you get a wodge of greaseproof paper (although you can ask for a plate if you’re feeling civilised), perfect for piles of grilled meats. I love their carrot spoon sweet with Greek yoghurt too. Watch out for the Stopotirimou initiative at some cafes and bars, where you get a 10% discount if you bring your own cup or glass. I’m an ice-cream addict and always on the lookout for amazing ice-cream and gelato. Thankfully there are some spots in Athens that don’t disappoint. Instagrammers, get thee to Dickie Dee where cones come with a flamboyant cotton candy skirt. Eastern influences at Konstantinidis and Karaköy Güllüoglu where you’ll find authentic dondurma. 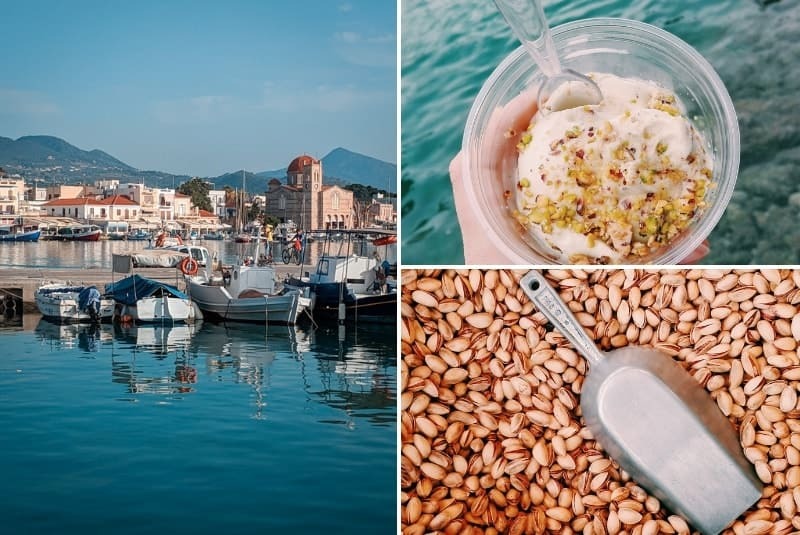 Neighbourhood highlights include Xara in Ano Patisia, local institution Waffle House out in Vouliagmeni, my own locals L’Arte de Gelato and Bakogiannis in Ilioupoli. I also love the ice-cream at Lukumades on Aiolou Street; a shop which specialises in deep-fried dough balls with various traditional and non-traditional toppings. Ice-cream flavours include kaimaki (with mastic), bougatsa, kazan, pistachio, and honey (you can order them separately to the loukoumades themselves). You’ll also find modern flavours like cookies and cream. Dessert cafes are a thing in Greece. 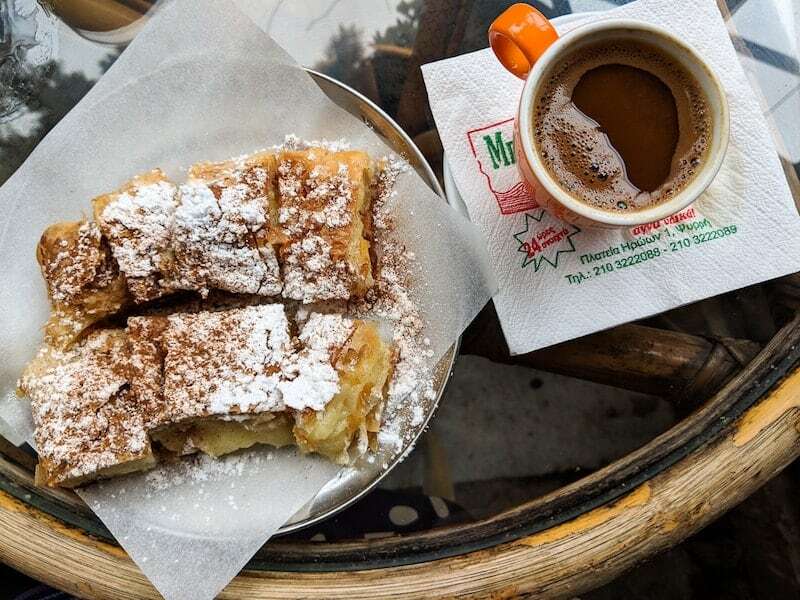 The cobbled streets of Psyrri are dotted with them, two of the most well-known being the twin delights of Bougatsa Thessaloniki and Nancy’s Sweet Home on Platia Iroon. This pedestrianised (circular) square is in the heart of Psyrri and is a lovely spot to chow away on bougatsa or galaktoboureko, cakes, waffles, enormous piles of ice-cream, etc., and is a popular spot in the afternoon for friends to meet over something sweet. Hot on the heels of the cronut came the bougatsa/croissant mashup craze called bougatsan. Mainly a thing in Thessaloniki, you can find it in Athens at Estrella. It’s pretty hard to find bad Greek food. But if you choose to eat at the tourist spots with good views and photo menus you will most likely find mediocre and overpriced moussaka. Conversations with locals will uncover great neighbourhood eats. In general, it’s easy to find vegetable-centred food in Greece, so vegetarians and vegans won’t suffer. There are salads and vegetable meze on every taverna menu, and you will also find lots of freshly squeezed juice stalls in central Athens. The classic favourite vegetarian restaurant of choice is called Avocado. Don’t be fooled by the hippie exterior – the Luminus Vegan is one of the tastiest dishes I’ve eaten in Athens. There’s also Vegan Nation right near Monastiraki, Lime Bistro in Psyrri and Veganaki out near the Temple of Olympian Zeus. The Travel Porter has an excellent article on Healthy Eating in Athens which features many eateries suitable for vegetarians and vegans. 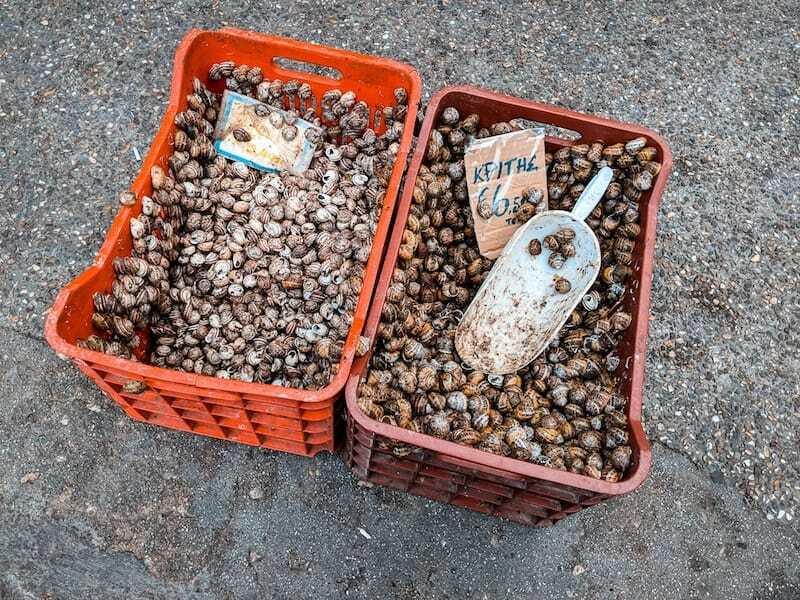 Greece has an undeserved reputation for dodgy retsina and naff table wine, but an exciting new scene has emerged as part of its cultural renaissance and inclination for local and traditional produce. Greek wine is an exciting adventure if you’ve never tried it before. After all, it’s one of the oldest wine-making regions in the world and there are hundreds of indigenous grape varieties that you won’t find anywhere else. There is a newfound care and attention to provenance. The Greek wine industry is on the up. Dry white Assyrtiko from Santorini is the Greek wine you’re most likely to find exported abroad and is a great variety to start with (as it’s delicious). 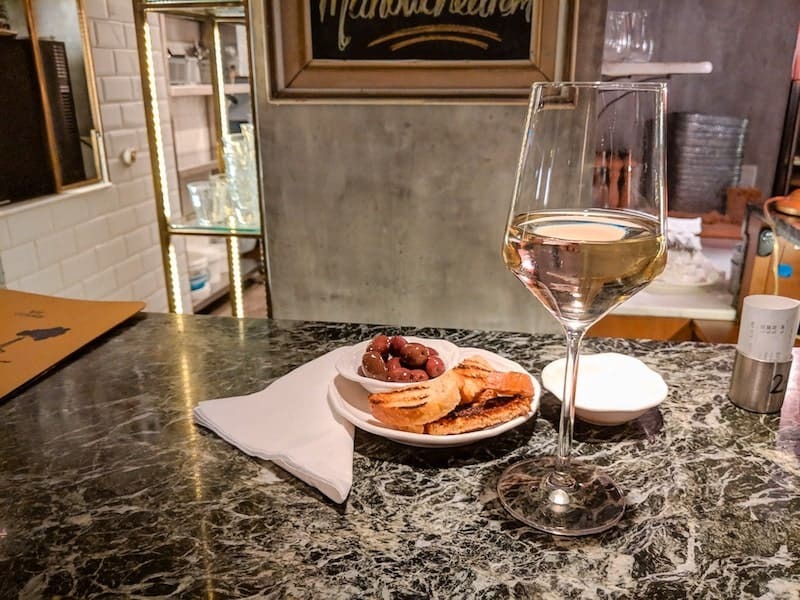 Several of the wine bars in Athens offer tasting flights and introductions to Greek wine – try Winepoint, Zampano and Cinque. I’m quite partial to little retsina myself (wine flavoured with Aleppo pine resin from barrels used to store it). The excellent Wine Folly has an article on Greek wine for beginners. The Big Three that you’ll find in tavernas and bars around the country are Mythos, Fix and Alpha. I’m a Fix fan. Craft beer is exploding in popularity in Greece too. Volkan is probably the most famous one; filtered through the volcanic rock of Santorini (although they’ve actually moved their brewery off the island). Try them all at specialist craft beer bars such as On Tap Athens, Barley Cargo or Berlin by 5 Drunk Men (yes, it’s really called that) in Pangrati. The student vibe of Exarchia makes it a grand spot for beer-based bar hopping. Tsipouro and raki are both pomace brandies distilled from the byproducts of winemaking. Over winter you’ll find the warming rakomelo – a drink made from warmed tsipouro, honey and cinnamon. One of the best things about the mass of concrete apartment blocks in Athens is the number of rooftop terraces from which you can enjoy a view of the Acropolis whilst you sup your drink. The climate in Athens is perfect for open-air, and you can’t beat an atmospheric view of the city and the Acropolis as the sun goes down. Varvakios Agora is the main food market in Athens. 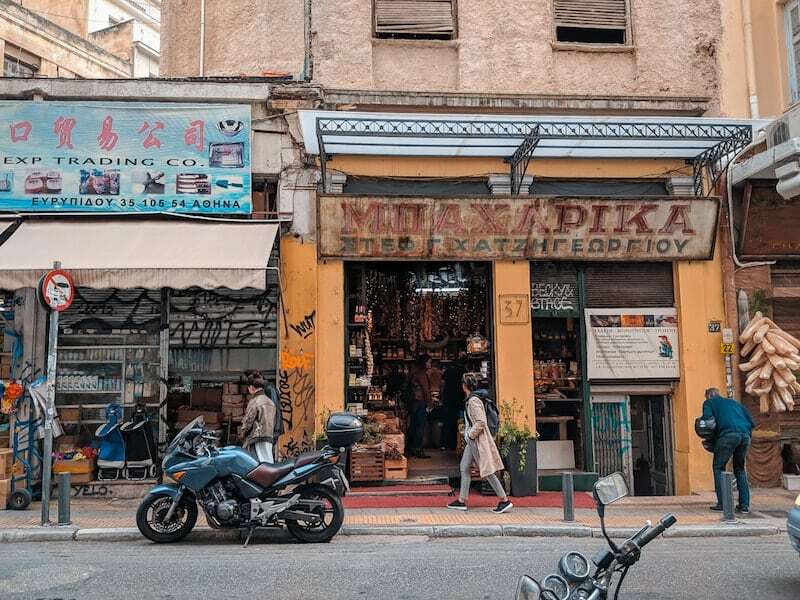 Just a 10-minute walk from the Monastiraki area, this is an old-school market for locals which (for now, at least) hasn’t yet become Disneyfied for tourists. It still has a raw and rowdy masculine atmosphere and is a thrilling place to explore, and a favourite of walking tours. The main covered indoors market is home to the meat and fish stalls (best to avoid if you’re squeamish). The surrounding streets are a warren of treats. Don’t miss nearby Evripidou street for spices and herbs, delis, cheese and sausage shops. Athens is an excellent picnic city. Shop in the market area for bits and bobs then take them up one of Athens’ hills or to the National Gardens for a picnic. Local farmer’s markets are called laiki agora and are held on different days in different neighbourhoods (XPat Athens has a list). Shopping at the markets is an excellent way to practise your Greek skills! Learn to cook or bake Greek classics at The Greek Kitchen, which also offers tours and wine tasting. All run with a minimum of one so no worries if you’re not in a group. Other options include Onion Athens, The Food Project, and The Cookery Club. Viator also has a decent selection of cooking classes. I also recommend checking out Airbnb, EatWith, Travelling Spoon and WithLocals for immersive food experiences. All visitors to Athens should check out the incredible This Is Your Athens initiative, which matches visitors with volunteer tour guides. There are 6 different themes, food being one of them. I’ve met some incredible and passionate people through this programme and highly recommend it. Don’t leave it to the last minute though, as they do book up. If learning about and devouring the best food is your topmost priority then the Culinary Backstreets have the most extensive tours (and a variety of interesting routes for depth). 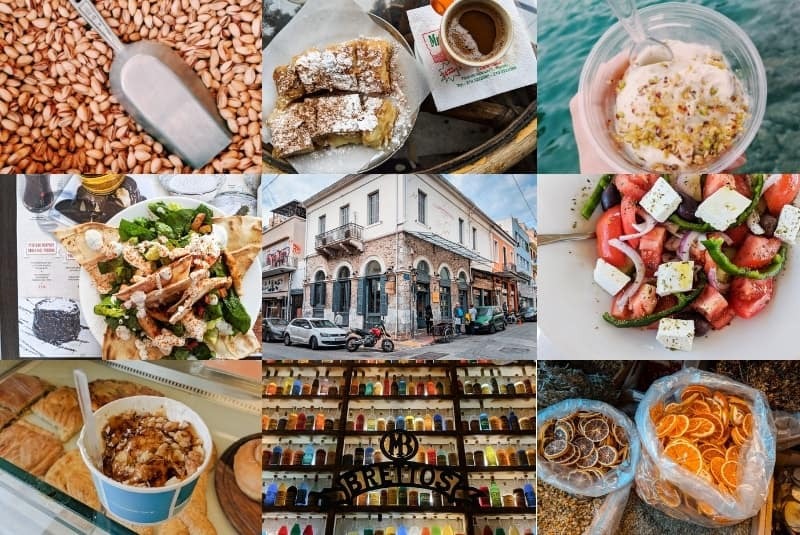 Top-rated tour outfit Alternative Athens have a range of interesting food experiences including the classic Delicious tour, home-cooked meals, cooking classes (including baklava) and tasting evenings. Vegetarian? Jewish? With the family?) 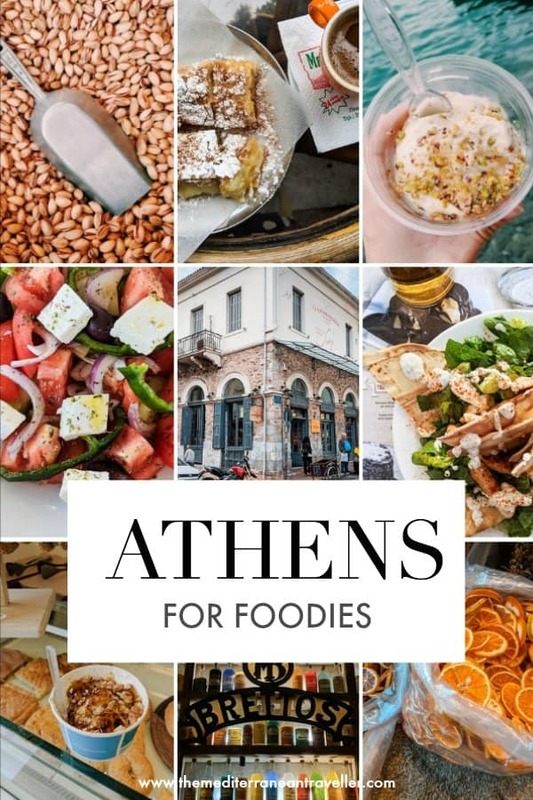 Foodie specialist Athens Food on Foot has something for everyone. 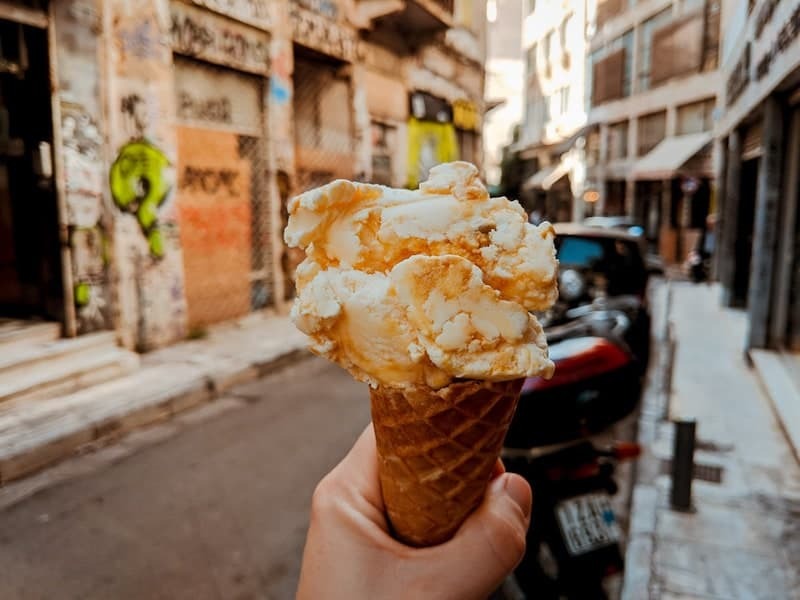 Intrepid Urban Adventures have an Exarchia Sweet Sins and Anarchy walking tour that including a number of sweet pit stops, and an Extreme Bites tour that takes in some of the more out-there dishes. And finally, you can be guided through the world of olive oil at GAEA (booking required). If you’re in Athens for a while then you might want to escape the pace of the city for a while, and enjoy the countryside as well as some delicious produce. Greece is the spiritual home of the olive tree so leave some room in your luggage for vacuum-packed olives, and beautiful olive-wood kitchenware. You won’t find any problem finding either in the souvenir shops of Plaka and around. If you’re hunting for goodies to take home then the best produce shops are on Evripidou Street and the surrounding area, not far from the Central Food Market. Think: meat and cheese delis, specialist dried herb shops, thyme and wildflower honeys, mountain teas, spoon sweets, co-operatives from particular islands, and commercial kitchenware and knick-knacks. A quick plea: these shops aren’t zoos, they’re someone’s livelihood. Do have a chat, buy something, and ask permission before snapping away with your camera or smartphone. Some of the shop owners are getting understandably annoyed with the hordes of tourists who wander in just to take photos for their social media. Also on Ermou (the main commercial street of Athens, leading to Syntagma Square) there are a couple of amazing shops selling all sorts of nuts and dried fruits (including dried kiwi). My current fave tipple is the delicious rose-tinted Otto’s Athens Vermouth, based on a recipe developed for King Otto in 1850 and revived by the bar team at The Clumsies. Oh – and Athens airport has a decent selection of goodies to buy, including in the duty-free section.